Who knew? The rain actually made it better! We couldn’t believe the turnout today, but more than the numbers, there was such a great spirit evident from all the visitors. Thousands of people trudging through the rain sounds depressing, but at the Mini Maker Faire it was a chorus of oohs, aahs, excited squeals, happy hellos, and fantastic melodies. We expected a spirit of DIY, but true to Dale’s vision, it was more of a DIWO (do-it-with-others) or DIO (do-it-ourselves), with Park Day Parents, makers, performers and visitors alike not just enjoying the event but always lending a hand when needed. Thank you to everyone who made this such an amazing day. Perhaps we should actually hope for rain next year? PS: Nice words about the event from the Oakland Tribune. Thanks for coming, Sean Maher! The Fixit Clinic is located upstairs in Studio One, the building on the north side of the campus. 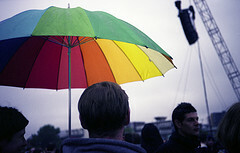 A Maker Experiment: Maker Faire + Rain = ? What’s changing if it rains? Clothes and other fabric to donate to the Costume-o-Rama-Rama: any size men’s womens and kids…in decent condition. Anything leftover will be donated to local charities. Your bike. Please consider biking to the Mini Maker Faire if you can. There is valet bike parking courtesy of the East Bay Bicycle Coalition. We do now have 2 lots near the school that will be available to ease the parking crunch. Please refer to the Get to the Faire page for more information. Wow, the workshops now sound all that much more appealing! Yes, we will publish the workshop schedule here on the blog later today. But do keep in mind that all the workshops are limited in space and are first come, first served, so if you’re really keen on one in particular, make sure you get there early to reserve yourself a space. Hey, if it rains, couldn’t something go wrong? Yes! We’ve been working hard on a rain plan, and we think it’s a good plan, but it’s likely we’ll experience some glitches as we make adjustments for these circumstances. We hope you’ll bear with us and enjoy the adventure! Oops, the prize lady fell down on the job yesterday, so today’s ticket buyers will be in the running for not one but TWO great prizes! That two great reasons to buy your tickets today, and it leaves one more left for Friday. Sorry, there is no prize for waiting until Saturday. And the prize for waiting until Sunday is higher prices. 😉 Remember, tickets are $5 more each on Sunday, whether you buy them at the door or online. First, though, congratulations to Michael Katz of San Leandro. He won the subscription to Make magazine on Tuesday when he bought 1 adult and 2 kid tickets. Go Mike! A copy of Geek Dad, signed by the author Ken Demead, who will be on hand Sunday with his radio controlled Lego demolition cars. 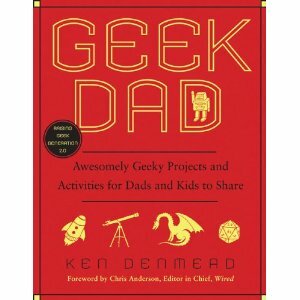 Geek Dad is a compendium of awesome projects to do with your kids, and the perfect thing to have in hand when walk away from the Mini Maker Faire inspired. 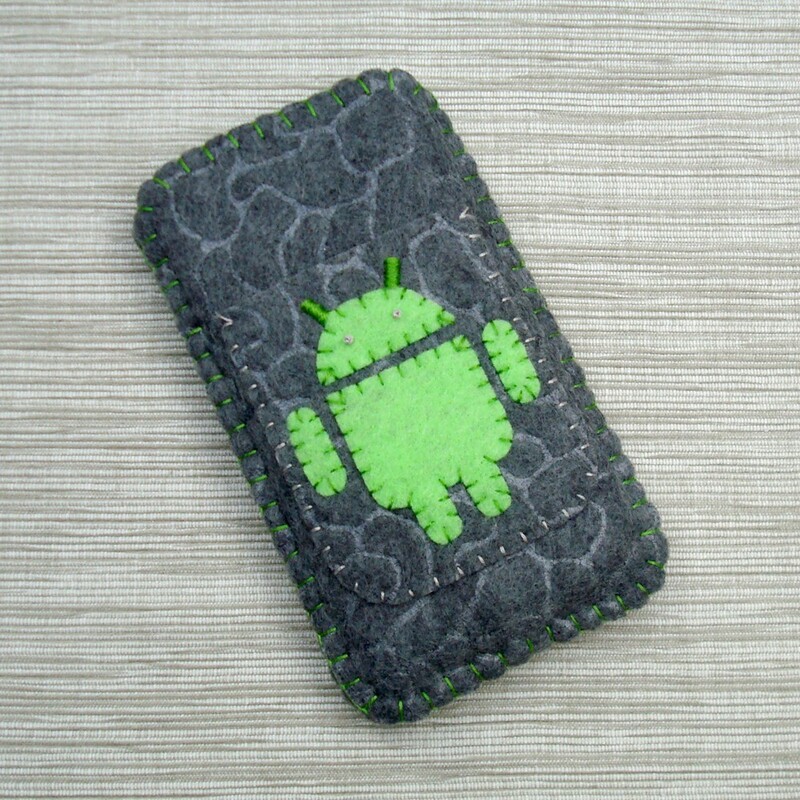 OR…a whimsical and functional Android phone cover from Fresh on Mondays’ Rebecca Grigsby, who will be showing her wares at the Faire. These handy designs include a pocket on the back to stash cash or a credit card, so it’s all you need to leave the house. Check out her Etsy store for the full line up. Be nice to her, and she’ll let you choose your favorite! 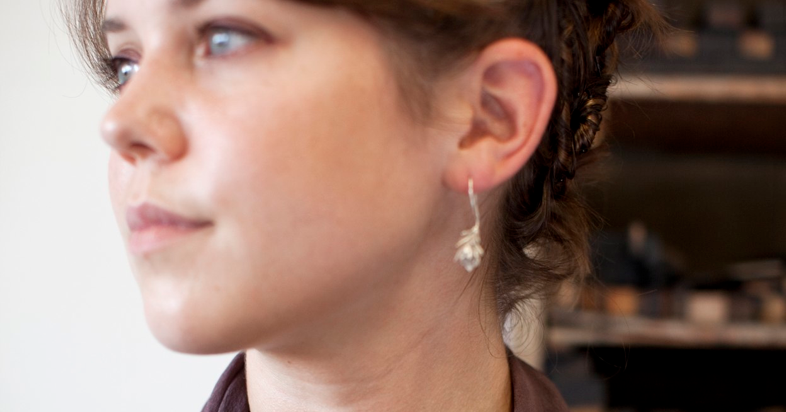 Congratulations to Kim Rankin for winning the beautiful earrings from Mani Designs in yesterdays’s drawing! 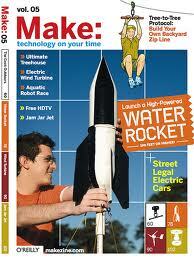 Today one lucky ticket buyer will get a year’s subscription to the magazine that started it all: Make. If you don’t know Make, you’re in for a treat. More like a quarterly book than a magazine, Make is the gold standard for the DIY (do-it-yourself) and DIWO (do-it-with-others) crowd. Inspiring, whimsical, creative, and challenging projects crowd every issue. 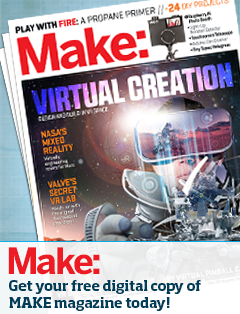 If it’s bold red and blue logo look familiar, that’s because the publishers of Make are also the producers of the Maker Faire, who have graciously allowed us to extend their “open source” brand to this event. After Sunday, you’ll be really glad you’re a subscriber. Buy a ticket by 7 pm today to be entered into the drawing for a one year subscription to Make. Remember, don’t wait until Sunday to buy, or you’ll pay $5 more per ticket! 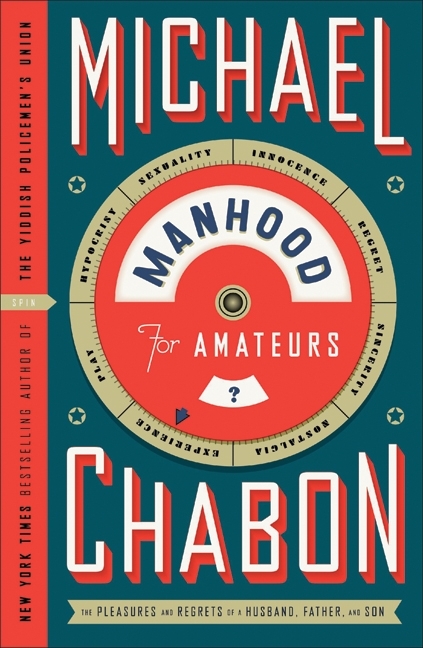 Congratulations to Laura Zuckerman of Oakland, whose purchase of 4 tickets yesterday won her the signed copy of Manhood for Amateurs by Michael Chabon! The seedpods, flowers, buds and twigs in my botanical series are collected from my walks in the woods near my home. 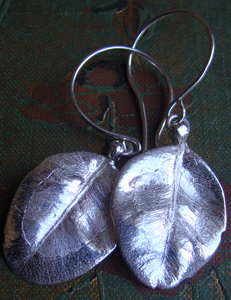 They are lost wax cast silver and gold originals of the actual flowers and branches that I gathered. This commitment to “live casting” insures that I must continually forage for or grow in my garden new material to be cast. Amber’s recent and past season jewelry will be on sale at the Mini Maker Faire next Sunday, but you can win these gorgeous boxwood earrings today by buying your tickets before 7 pm tonight. To wrap up our last week before the Maker Faire, we’ve lined up a series of great stuff to give away. Each ticket you buy next week will automatically enter you into a drawing for the prize of the day. We’ll start tomorrow (Sunday) with a copy of Manhood for Amateursn, signed by the author Michael Chabon, PDS parent and co-leader of the comics workshop at the Faire along with Nick Dragotta of Howtoons. Buy your tickets between midnight Saturday and 7 pm on Sunday to qualify to be entered in this drawing. We’ll announce Sunday’s winner at the end of the day, when we announce Monday’s prize. As a mom with a full-time start-up job, my desire to live off the land is largely aspirational. I do keep six lovely chickens, who are remarkably easy to care for, and have a small garden which I tend to neglect (the chickens enjoy it, though!) But there’s so much more I could do, and it’s good to have goals. Good thing the East Bay Mini Maker Faire will be there to inspire me, and everyone else, to become real urban homesteaders. Let’s take a look at some of these Makers. First off, let’s talk about getting to the Mini Maker Faire. Farmers may drive big ole trucks, but urban homesteaders bike. Which is a good thing, because there’s not remotely enough car parking near the school to accommodate the crowds we’re expecting. Fortunately, the East Bay Bicycle Coalition will be there to take care of your bike during your visit. 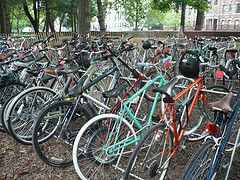 They have graciously offered to provide secure bike parking, and since they’ve done this before and know what they’re doing, it will be organized and efficient. Repeat after me: I WILL BIKE to the East Bay Mini Maker Faire. Next up is my favorite. 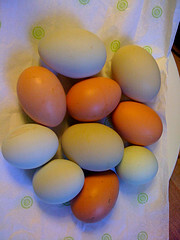 Mario Klip from Holland Hen Houses is going to bring a few coops, and hopefully a few hens, and all of you Bay Area foodies who’ve been thinking about the joys of fresh-from-the-nesting-box eggs can ask Mario everything you need to know about raising chickens. I can personally attest to fact that it’s cheaper to just buy your eggs at the supermarket, but that the moment you reach under your girl and feel that warm, hard, ovoid object, you will be so delighted you won’t care. Not only are the eggs great, but hens are hysterical pets. Mine insist on coming in the house and acting like they own the place. But don’t take chicken keeping lightly; do it by the book or you’re almost certain to face heartbreak. Come by and ask Mario how to do it right. Next is a chance to learn from the youngest makers. The Kindergarten class at Park Day School will demonstrate how to make butter from cream but simply shaking the cream in a jam jar. They will have baguette slices for actually tasting the butter and jam jars for you to take some home with you. What could be sweeter, and more fun with your little one? Speaking of jam jars, sweet, and fun, do we have the best jam-making teacher ever! Tim O’Reilly is famous as a computer book publisher, the CEO of the company that produces Maker Faire and MAKE magazine, and generally a convener of the geeks we like to watch, but he’s also famous for his jam and scones, which have been written up not only in Cooking for Geeks (which hit the New York Times bestseller list) but also in a Wired magazine profile. 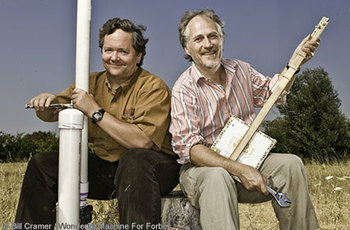 Tim is going to show us his secret to great jam in a demonstration workshop at noon on Sunday in the Magnolia building. He is bested only by his colleague Dale Dougherty, the father of the Make movement and head of the Make division at O’Reilly, who will be on hand to show us how to press your own apple cider. Dale’s cider demonstration is at 1 pm in the Magnolia building. Plan to come early for both of these; we have very limited seating. 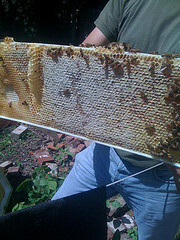 So now your home makes its own honey, eggs, butter, jam and cider. Shouldn’t it capture its own water, too? Two fantastic Makers will be on hand to help with this one. The lovely folks at WaterWorks held a festival of water-wise strategies, and are bringing a few of the best exhibits, including a system for growing veggies on a small footprint, an all season rain-catcher/clothes-dryer/garden sculpture, and play-pump that lets kids bounce on a horse’s back and watch the pump work. To complement their work, Greywater Action will be on hand with a life sized greywater system, mini-water harvesting system, and a model composting toilet. Learn how these simple practices can transform your home water systems from wasting and polluting water, to conserving and protecting it. You’re really urban homesteading now! As a teacher, crafter and blogger, Erika Horvath knows the importance of helping children see themselves as creators as well as consumers, and to inspire them to shape the world around them. She believes making and exploring how others make things is as important as school to kids’ educations, so she volunteered to help us get the word out to local schools. If you’re a local parent or a teacher, get in touch with Erika about spreading the word to your school community. 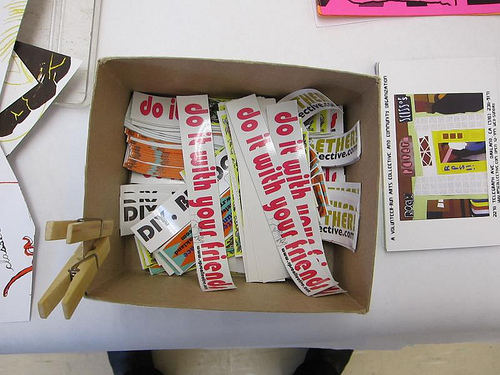 The East Bay Mini Maker can benefit your school, too. Schools who promote the event can register for either a 15% discount for their community, or to get 15% of the value of tickets sold back to their school to benefit their own programs. All you have to do is contact us, tell us whether you want the discount or the affiliate program (bonus cash for your school) and we’ll send you a code that your community can use to register. 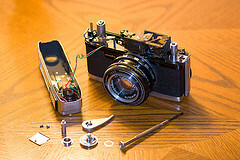 Ken will be at the East Bay Mini Maker Faire, and you’ll be able ask him about any of these projects. If you’re nice, he’ll also let you drive one of the cars in his remote controlled demolition derby, made out of — you guessed it — pool noodles, duct tape, radio controlled cars, and legos. 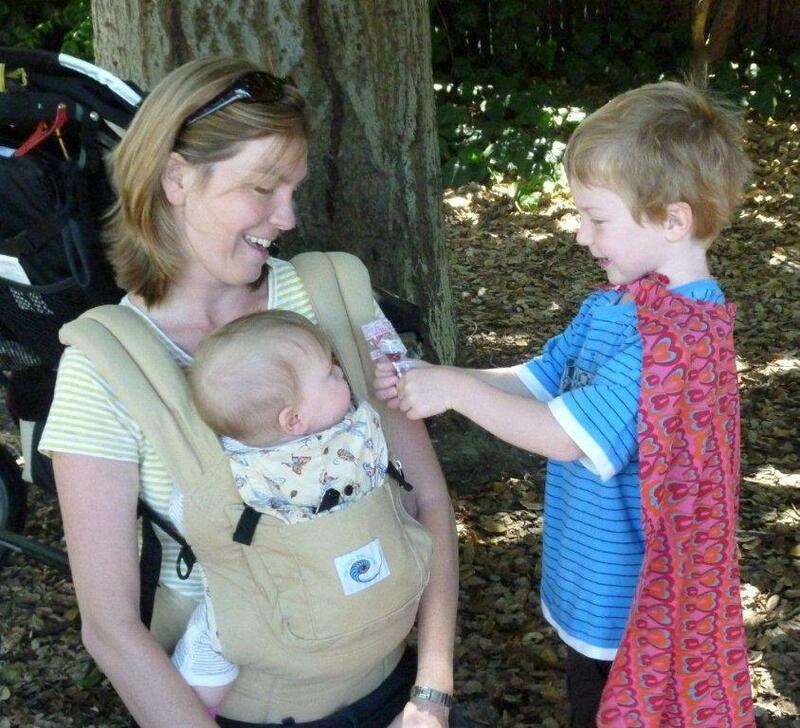 He’s bringing it to the EBMMF, for kids and their own dads — and moms! — to play with.